SPECIAL NOTE: Andrei Tchmil was originally from the Russian City of Khabarovsk in Siberia. His family moved to the Ukraine and the young Tchmil entered a cycling academy in Moldavia. After the fall of the Soviet Union in 1989 he moved to Belgium to pursue a professional cycling career. After the early breakaways were caught the peloton started the last few climbs of the famous Capi. Tifosi favorite Marco Pantani attacked on the Cipressa 25 kms from the finish. Michele Bartoli quickly answered the move and split the peloton into 3 groups. The attentive favorites were present in the front pack. 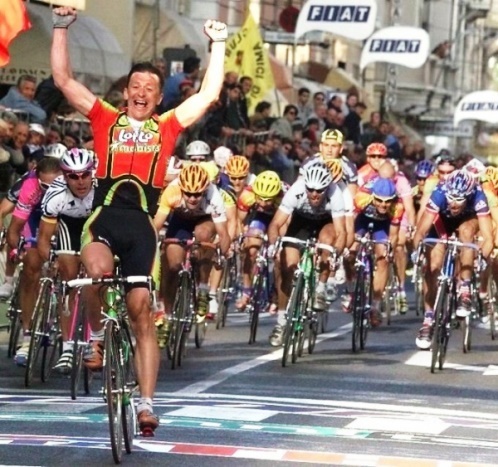 1996 M-SR winner Gabriele Colombo attacked the lead group on the Poggio with 8 kms to go. He opened a 7 second gap over the top of the climb. Colombo’s bold move was neutralized on the Via Roma in San Remo in the final kilometer. At 600 meters the 36-year old Tchmil attacked and held off the late charge of two time M-SR winner Erik Zabel. The prestigious victory gave Andrei Tchmil the first win of the 1999 World Cup season. SPECIAL NOTE: With the victory Andrei Tchmil became the oldest winner of M-SR, 36 years and 57 days. 1. Andrei TCHMIL (Bel) 6h52'47"